Bill Ermann is by no means new to the Liberal community, nor is he new to Southwest Medical Center. He is, however, now in a new position at the local healthcare facility Vice President and Chief Financial Officer. 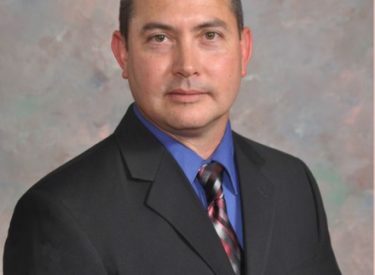 Ermann, who officially began his new duties on June 28, is filling the position vacated by former Vice President and CFO DeLany Fawkes who retired from Southwest Medical Center at the end of June. Ermann first worked for Southwest Medical Center in 2001 when he accepted the position of Controller for the hospital. He has also worked for a 571-bed hospital in Pascagoula, Mississippi, a 301-bed hospital in West Virginia, a 300-bed hospital in Mobile, Alabama and a 75-bed hospital in Bonham, Texas. Ermann has experience with both for-profit and non-profit hospitals. He most recently served as Southwest Medical Center assistant CFO. Ermann earned his bachelor of science degree in public accounting from Mesa State College in Grand Junction, Colorado and is a non-practicing CPA. Ermann and his wife, Dayna, have three children. Their oldest daughter, a recent graduate of Liberal High School, will be attending college in the fall at a university in Oregon where she plans to major in science and swim on the swim team. Their other daughter will be attending Liberal High School this next year and their son will be in elementary school. Dayna is a stay-at-home mom who keeps busy as co-president of the Liberal Band Boosters and volunteering extensively with various organizations and activities through the school. Like his wife, Ermann is also active in school activities. He serves as co-president with Dayna of the Liberal Band Boosters and is the treasurer for SWAT (Southwest Aquatics Swim Team). He is also a member of the Kiwanis Early Morning Risers and has coached soccer teams before. In his spare time, Ermann enjoys skiing, canoeing, and spending time with his family. Ermann is glad to be back in Southwest Kansas.